Adductors: What are the adductor muscles attachments and actions? 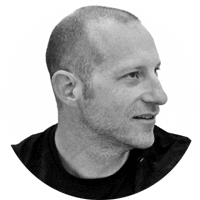 What can we learn about the adductor muscles from their names? There are three muscles in this group whose names start with the word, adductor. We’ve covered adductor magnus in a previous post, so we’ll just take a look at adductor brevis and adductor longus. The word adductor describes the action of these muscles. Adductor comes from the Latin words “ad” which means “toward” and “ducere” which means “to lead”. The second word in these two muscle names refers to the size of the muscle. The word brevis is a Latin word meaning short. The word longus is a Latin word meaning long. You could put the words together then to get an understanding of the size and action of each muscle. Adductor brevis is“a short muscle that leads something toward the body”. Adductor longus then is “a long muscle that leads something toward the body”. 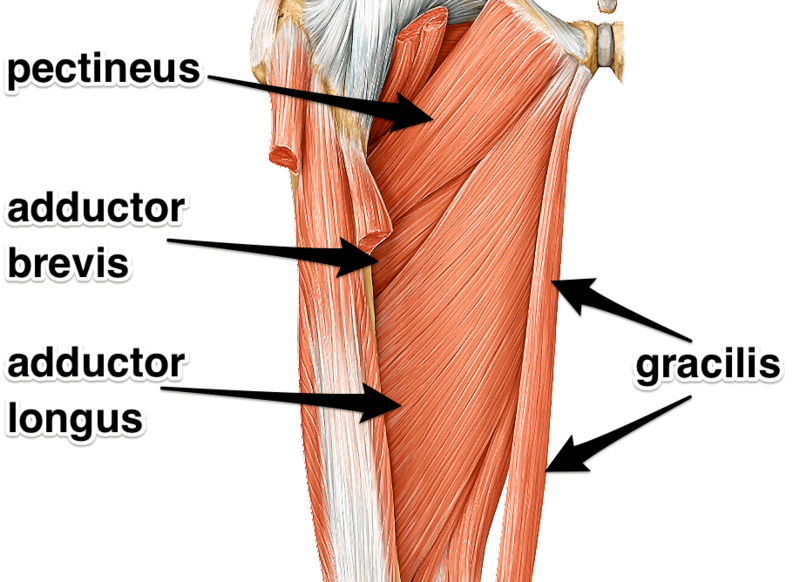 The Gracilis muscle is also included in the adductor group of muscles. Its name describes its shape. Gracilis is the Latin word for slender. Gracilis is the most medial of the adductors. It also affects the knee joint. 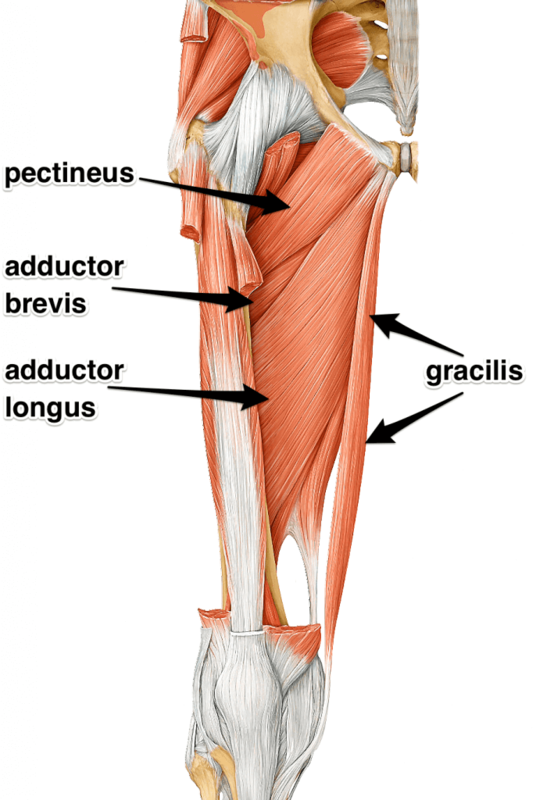 Pectineus is the last of the muscles that we’ll look at in the adductor group. Its name describes its location. Pectineus comes from the Latin word “pecten” which means comb. The bone that is now referred to as the pubic bone was previously known as the “os pecten” or “comb bone” due to its shape. Pectineus is the most anterior of the adductor group. Where do the adductor muscles attach? 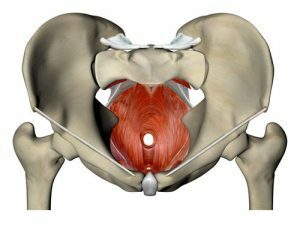 The adductors are layered muscles that fan out from the small area of attachment on the pubic bone toward the femur. Let’s start with Pectineus. Pectineus originates on the ramus of the pubis. It inserts between the lesser trochanter and the linea aspera. Adductor brevis originates on the inferior ramus of the pubis. It inserts on this area of the linea aspera. It originates on the anterior pubis. It inserts on the linea aspera. Gracilis is the most medial of the adductors. Specifically, it originates on the anterior pubis. It inserts on the pes anserine. This is the second of three muscles that attach onto this spot. 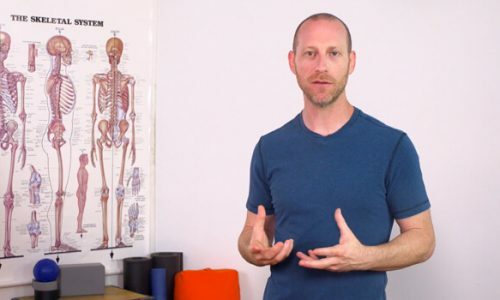 What actions do the adductors do? Pectineus assists in both adduction and flexion of the femur at the hip joint. The primary function of adductor brevis is adduction of the thigh at the hip joint. Additionally, Adductor brevis assists in flexion and medial rotation of the femur at the hip joint. The primary action of Adductor longus is adduction of the thigh at the hip joint. It also assists in flexion and medial rotation of the femur at the hip joint. 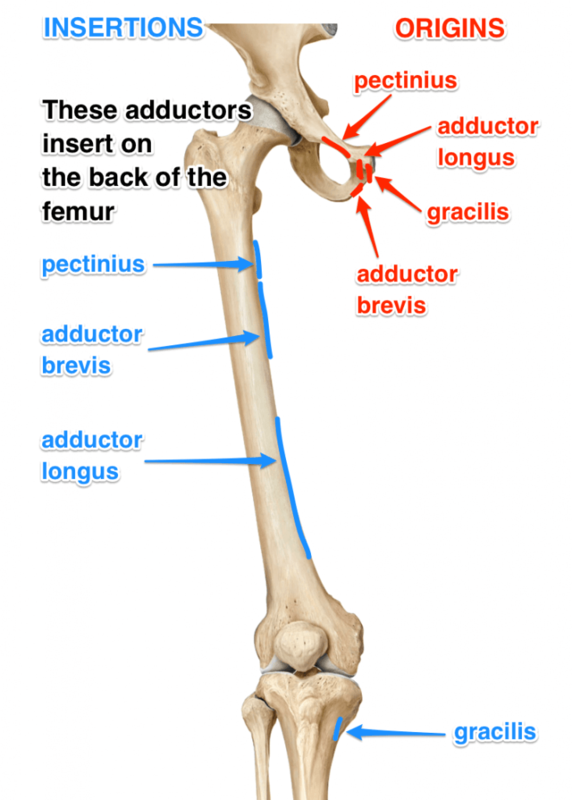 The primary action of Gracilis is adduction of the thigh. It also assists in flexion of the knee and medial rotation of that flexed knee, similar to what we’ll see when we look at sartorius. Any time our legs are squeezing together, the adductors are on. Shalabhasana is a good example of those adductors keeping the legs together. Baddha konasana is a classic adductor stretch. We are doing the opposite of two out of the three main actions. We are both abducting and externally rotating. Trigger points in the pectineus muscle, one of the adductor muscles. 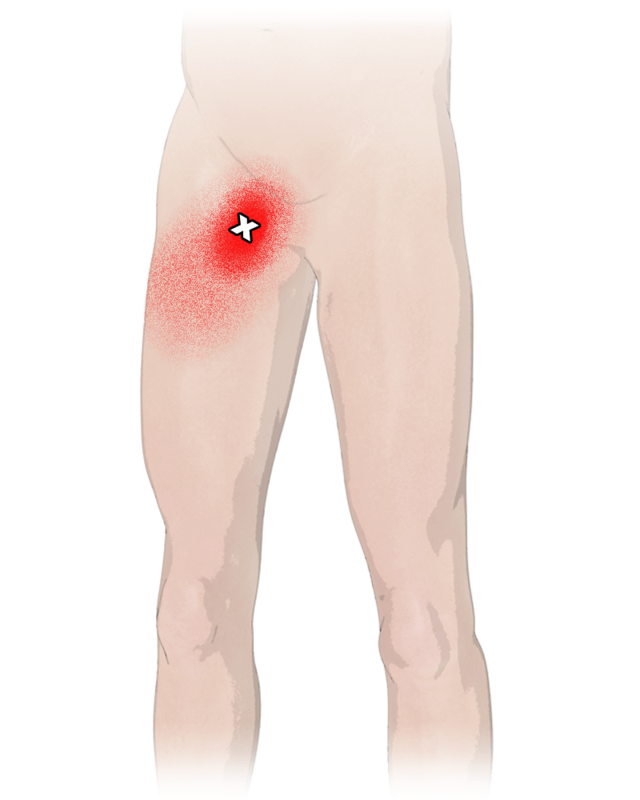 Trigger points in the adductor magnus muscle, one of the adductor muscles.